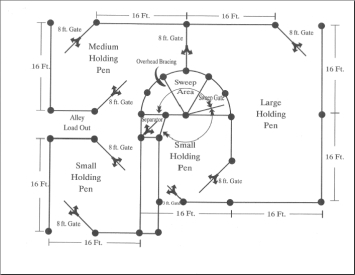 The Titan Pen has an overall area of approximately 48' x 35', and can manage approximately 60 head of cattle. All working pens are constructed from 2-3/8" 14 ga pipe and 5/8" solid rod, and painted Grey. Each pen is personally constructed onsite at our shop in Stilwell, Okla, and can optionally be delivered at you request. All of our panels are 5' 6" tall. You delivered my product right on time. This system is exactly what I wanted. Easy to set up and tear down if need be. Not a lightweight corral system that will be bent up in a few years. Worth every penny I spent. Heavy duty and easy to run. Thanks for your making such a long trip to Colorado. This is gonna make working my cattle so much easier. WOW!!! My Titan Pen was just delivered and set-up today. It was great! Called in my cows, fed them, sprayed them, and tagged a couple calves. Made it so easy to work my cows. The self-catching headgate is the only way to go. I would definitely recommend one of these pens.